I pulled the last Dev branch. I got a launch Pad abort every time I try since this morning, MPS don't reach 100% and Launch is automatically aborted. As Gingin said, big thanks Wayne, that is really a huge and I suspect quite unpleasant work you're doing there, that's very much appreciated! Not sure about the particular combination with 2018.1.1 - I've tested launch with the Shuttle stable against 2018.3.1 which worked fine. 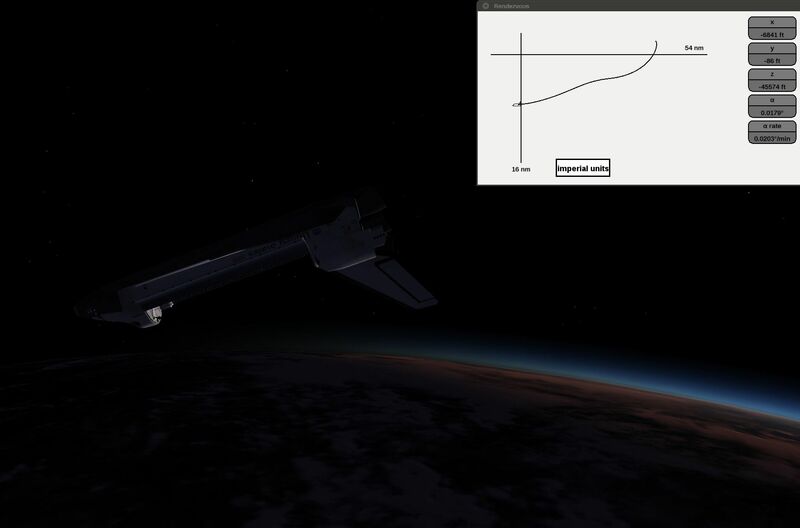 I've just tested the latest Shuttle development with an older FG version and it also works fine. So either there's a regression somewhere in FG or I don't know, but there doesn't seem anything odd on my side. Interesting, I have had that for awhile in 2018 ??. I figured it was something I was doing wrong although I was following the checklist and all was green. I just now tried it in my current build, FGFS next of about a couple weeks, 2018.3.2 fgdata. Worked fine! 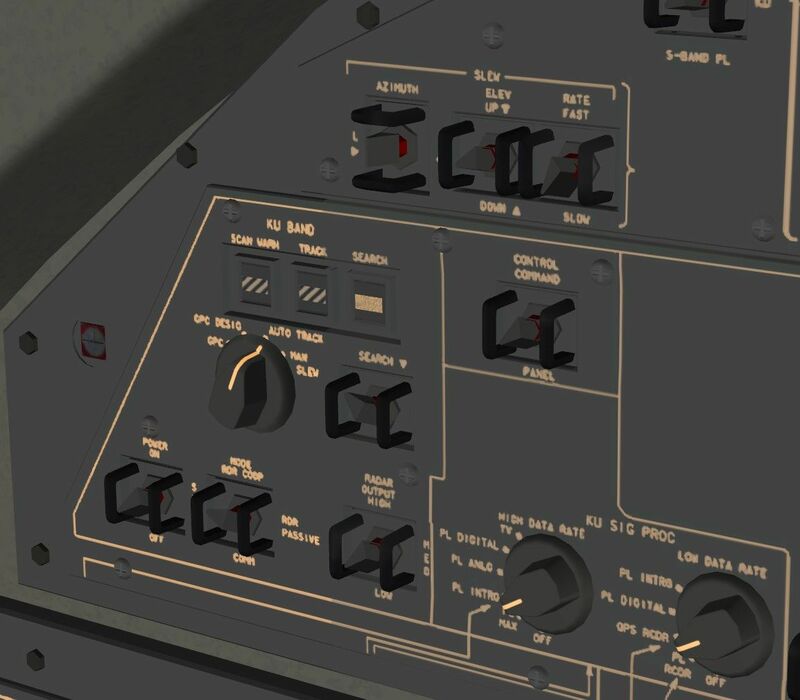 Do you think it is possible to increase the readibility of the text above the switches? I pushed the corrections to the normals on A1 and A11. Thanks for spotting them and letting me know. Yes, i don't recall if that legend was a rip from the 3d view images or from the crew manual. I need to look at the saved art. Personally, I thought those weren't near as bad as others I've been noticing. There was method to our madness in the origination of those textures, we tried when possible to rip the actual text used on the original panels. Unfortunately there were some angles better then others. got some troubles at TAEM after some quite non-standard re-entries. I don't understand what's going on, any help appreciated. Edit: Trying a few times more, I saved my "a..." by pulling it hard!! Last edited by eatdirt on Sun Jan 27, 2019 10:19 pm, edited 1 time in total. qbar comes right from JSBSim, so we have to assume that the value is really reflecting the orbiter state in the atmosphere (there's no possibly fudging I can think of to make that go away). It can grow fast if you sink fast... and it would be rather unusual to be so close to the limit during entry (we do pitch down at TAEM interface because we won't fly high AoA any more, so that goes along with an increased sinkrate). Basically you lose control authority and can't pull up because the actuator stalls and can't move the airfoil against the pressure any more. So I don't think that's a bug, I think your chosen pattern really killed you. Thanks for the explanations, makes sense, we clearly see it in the timelapse. I'll try a more aggressive reentry to loose more energy before TAEM, or switch to White Sands to be more gentle all over! @Thorsten: A quick return on the BPV stuff with ISS target. Most of the time, I got the BPV inverted as I observed some days ago. For Earth and Solar tracking, it works as intended. I almost never used them before with OPS 202 as we had quite huge velocity. I tried them with small DV associated with small Lambert corrections. Do you use them also for Rendez vous? I even tested changing from +X to -X to see if there was any attitude region in which it'd always align the wrong axis (technically we maximize the dot product of body axis and tracking vector, so this should not happen...), but it did not. So the next idea would be that there's some geographical region for which this fails - basically once I know the pattern, I can add - signs where needed... I'll poke a bit more. I've hacked in every jet individually from a technical schematic (they're not all the same thrust, some are a few percent weaker), I've double-checked the ISP and propellant use. To my recollection the RCS translation mode fires all available jets, so the only thing to be checked is whether that is actually true - otherwise I can't do anything about the acceleration. Edit: I've just checked that - firing the RCS for 10 seconds gave me 5.4 ft/s additional velocity and I saw all four backward firing jets go off. 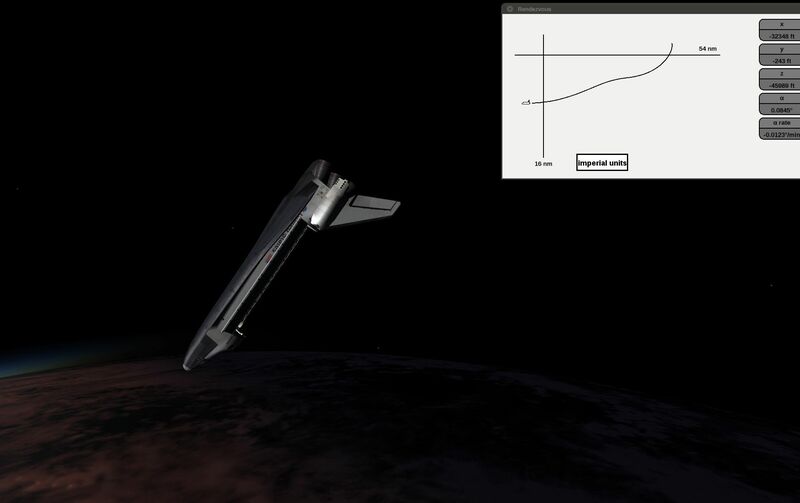 So this seems okay-ish (actual acceleration depends on orbiter weight of course, and using the keyboard it takes a second to ramp to full thrust). Re-checking the tracking axes, I still can't find anything odd (except that DAP-A has the deadbands too tight for the job).